Teamsters Local 79 UPS workers are voting no on tentative agreement | Fight Back! 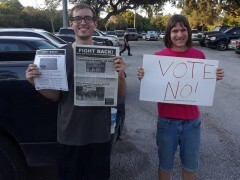 Tampa, FL - With the vote count a little less than two weeks out, west Florida UPSers will be voting ‘no’ on the tentative agreement. Despite retaliation from the company, rank-and-file militants have been informing the membership of Local 79 throughout the contract negotiation process. Now that balloting information has been mailed out and the vote is underway they are making sure UPS Teamsters have received their ballots and voted. “Between the efforts of the company and the union to push this contract through, we need to inform the rank and file and get them to vote this deal down,” said Jerrica Hoey, one of the lead organizers for the education campaign. 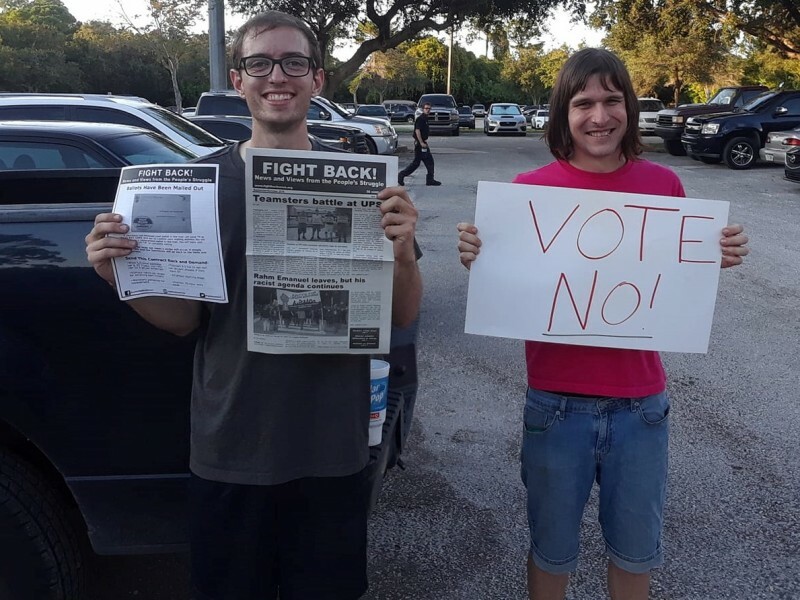 Local 79’s executive board, which represents UPS employees in nine counties of western Florida, has neither endorsed a ‘yes’ vote nor a ‘no’ vote on the tentative agreement. For the 2013 contract, then-president Kenneth Wood and Local 79 leadership urged the membership to vote yes. Part-timers inside the warehouse are also voting no. K.C. Hernandez, a sorter with 19 years seniority, is tired of concessionary contracts. “This is my fourth contract and every time we have conceded more while they continue to have record profits.” UPS made over $6 billion in profits last year. If you have not yet received your balloting information in the mail or need new materials, call your local union as soon as possible. Voting will end Oct. 5 at 1 p.m. Eastern Time and the count will take place later that day at 8 p.m.